I know, so in honour of the Scottish effort I've altered my ratings. Damn straight. Shades of Gordon Bulloch in 2005. Except that Ross won a test! I'm really eating my words now. Interesting subbing but what a game. Wish Phillips hit someone though, would have been great to see. I only have one complaint about the whole series... Paul O'Connell. Same about POC. Should have been BOD. Shame Philipps didn't lay F.Steyn out cold, that would have been awesome - though he would have got quite a lengthy ban! did they want justice for adam jones by giving burger a longer ban? one is adam jones, one is forrest gump, but which is which? 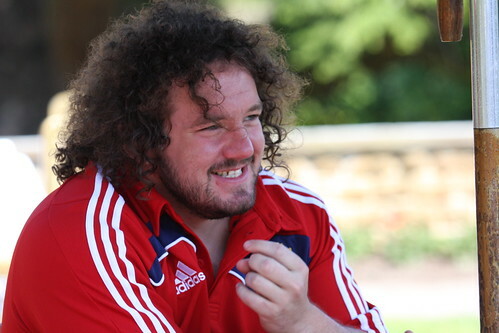 Talking of Adam Jones, he is out for 6 months now. And the Boks thought they were hard done by Botha's suspension. Idiots. Oh crap. Simon Shaw has been cited I'm not happy about that. Obviously that knee in the scrum-half (Du Preez?) - I assume. Doubt he'll get anything though, if he does it will be short. He tripped but it could have been a deliberate knee. I hope for his sake he doesn't - an absolute legend of the game. He is 35 I think, he had a massive game. I really hope he doesn't get a ban. Hope he gets to play for England again. its still average retirement age, i doubt he has more than one season left and he doesnt even have the oportunity to win the HC. Yeah I suppose so, unfortunately. Shame about the heineken cup. 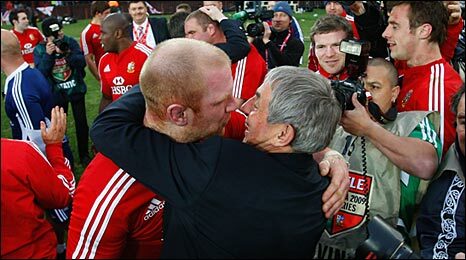 At least he has won the premiership and a test with the Lions. It would have been nice to see hime win the H.Cup. He's had a great career, but is probably one of the most underrated locks of his generation. I personally think he's up there with Johnson and the other obvious ones, an absolute legend. He's still probably the best English lock as well! The number of decent English locks around is pitifully low. you do know hes won 2 heineken cups? also three premierships, two tetley bitters, one powergen and european sheild. not to mention a world cup, a world cup runner up and a member of a successful lions tour and now a winner of a lions test. i think he's had his fair share of glory throughout his career, and he wont mind being called Simon Shaw MBE for his hard work either. top player, if it wasnt for martin johnson would of been known as one of the greats i think. I think Lawes could be good, but he needs to bulk up more and he seems a bit too hot headed for my liking. Blaze was a good prospect, but he's played f*ck all recently because of injury. We really need some new locks. I thought Lawes played back row? He's still very young, he's got plenty of time still to reach his potential. Blaze is 24, which is still youngish for a lock, but he needs to start putting in big performances. Deacon can't be anything more than a stop-gap really, he's a decent player but not top-class international standard. Skivington should play more often this season for Wasps, with Palmer off to France. He should be in or around the England squad I feel. Lawes can play either, he's very similar to Croft. Less technically skilled, but makes up for it in sheer athleticism.